McCombs is currently building a new home for their graduate programs. Construction began in fall of 2014 and is set to be completed by the summer of 2017. The new building, called Robert B. Rowling Hall­– or just Rowling Hall– will be 458,000 sq. ft. of traditional, tiered classrooms as well as a multitude of adaptive spaces for meetings, brainstorming and invention. McCombs has 126 tenure-track and 102 non-tenure track faculty members who are consistently ranked among the top 10 national faculties. They teach subjects covering five departments: accounting, finance, management, marketing and Information, Risk & Operations Management (IROM). Aside from their impressive educational background they also boast having real-world business expertise to bring into the classrooms. There are 12,790 total enrolled students in the McCombs School of Business, with 6,356 Business Foundation students, 4,686 undergraduates, 1,649 students in masters programs, and 99 in doctoral programs. 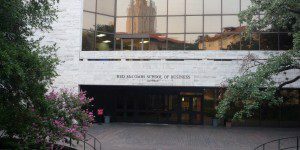 The McCombs School of Business offers six different MBA programs. There is a traditional two-year, full-time MBA degree and the Texas Executive MBA, which can be completed at the main campus in Austin. McCombs also offers a part-time Texas Evening MBA on the main campus as well as at two other University of Texas locations: Dallas/Fort Worth or Houston. Finally they offer a dual-degree executive MBA program in Mexico City awarding an MBA from The University of Texas at Austin and a Master’s of Administration from Tecnológico de Monterrey – Campus Santa Fe.